For TachStrip part number 015B625-F to be used as separate alarms, cut the web separating alarm units at the designed location with ordinary cutting pliers. For three wire DC fans operating at supply voltages between 5.0 and 25.0 VDC, TachStrip distributes power to the fan in addition to accepting tachometer pulses from the fan. Connect the fan wires to J1. Fan wires are usually color coded with red for +, black for – and white or yellow for A (alarm). The maximum current that can be distributed to the fan via header J1 is 4.0 Amps. Normally it is necessary to connect power to only one J2 header in a TachStrip (015B625-F). However, this connector is rated at 4.0 Amps maximum. If the total current used by all DC fans powered by TachStrip exceeds 4.0 Amps, power connections should be made at additional + and – pins. For most fans, the amplitude of tachometer pulses will be equal to the voltage applied to the fan (e.g. a 12 VDC fan usually generates 12 VDC tachometer pulses). However, some fans generate tachometer pulses at a lower voltage (e.g. 5 VDC pulses from a 12 VDC fan). In these cases, TachStrip must be powered with a voltage equal to or less than the amplitude of the pulses generated by the fan and it cannot therefore, distribute power to the fans. Though the maximum voltage that can be applied to TachStrip is 25 VDC, it can be used with fans operating at higher voltages. In this case, it does not distribute power to the fans. A supply voltage equal to or less than the amplitude of the pulses supplied by the fans is used to power TachStrip. Connect the negative fan lead to J1:- and the fan tachometer pulse lead to J1:A. No connection is made to J1:+. TachStrip cannot distribute AC power to an AC fan. 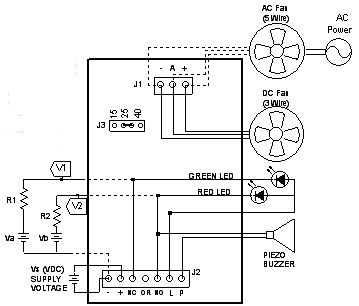 AC fans usually have 5 wires, 2 for power and 3 for the tachometer pulse circuit. Connect the AC fan power leads to the rated source of power. Connect the three tachometer pulse leads to J1. TachStrip distributes power to run the tachometer pulse circuits within the fans. Apply a DC voltage as specified by the fan manufacturer for the tachometer pulse circuits at J2.